A Fully Integrated IT Enterprise Equals "Best-in-Class"
For businesses in the service industry, a key characteristic of Jolt Consulting Group’s Service Excellence Curve for Best-in-Class operations is a fully integrated IT infrastructure that provides full visibility of the customer across the enterprise. Why is this so imperative today? The answer lies in our consumer reality: customers are more empowered than ever before, with access to a wealth of insights and have ever-demanding customer experience expectations. This expanded knowledge influences consumer purchasing decisions and affects their loyalty to a product or service making the buyer/seller relationships much more transparent in favor of the customer. A fully integrated IT enterprise enables organizations to capture insight into the customer interaction, behavior, and trends creating a unified view of customer data available to all key internal stakeholders which enables companies to provide elevated customer experience (CX), rather than passing the customer from department to department. There is also an internal operating efficiency aspect. An Aberdeen study found that the average employee spends up to 11 percent of their time navigating different applications in search of information needed to do their job that costs businesses $1.1 million each year. Best-in-Class organizations can alleviate this challenge by integrating their IT infrastructure around the customer. There are various inputs and outputs that make an integrated IT systems infrastructure beneficial for a service organization when vying for Best-in-Class status, including the collection of data points which, when utilized properly, can have profound effects on sales, marketing, and service. According to a study by Aberdeen, top performing businesses use a data-driven approach to alleviate the challenges impacting their ability to delight customers. With many organizations collecting “Big Data” daily from multiple channels like web, social media, email, in-person customer interactions and through different systems such as CRM, service, ERP, and marketing automation, there’s a wealth of information available. While this practice is a tremendous step towards better serving customers, the abundance of data points can easily overwhelm an organization. To solve this challenge, Best-in-Class firms eliminate business silos and create a unified view of customer data throughout the organization. Providing employees seamless access to data insights, including real-time information, allows them to effectively interact with this information and deliver elevated CX; a prerequisite for this strategy is an integrated IT enterprise. Top-performing businesses use numerous activities to put insights into action, especially as it relates to their sales and marketing strategies. For example, these companies are 38 percent more likely to deliver consistent customer messaging via omni-channels, which is personalized based on customer data. From a sales and marketing standpoint, Big Data that’s acted upon enables organizations to provide more relevant messaging to customers with the intent of capturing their attention and share of wallet. Best-in-Class firms use customer data to deliver proactive communications, often automated, such as an email with case studies or an invitation to an upcoming webinar based upon customer behavior such as searching a company website. With access to real-time customer data, companies can utilize customer history to capitalize on selling opportunities. For example, a customer who has recently used self-service to address a product issue or downloaded a product manual is an outstanding sales lead for a sales employee who has easy access to this information. This allows the sales interaction to be highly personalized while minimizing customer effort and providing excellent CX, thereby increasing the sales potential. The goal of personalized communication, proactive messaging, and elevated CX is to engender loyalty and trust with the customer; sales organizations can accomplish this more easily via an integrated IT systems infrastructure. 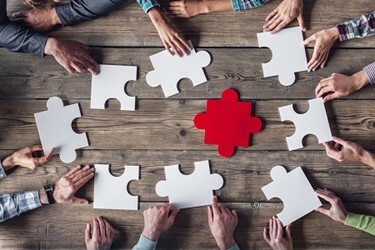 One way companies connect service excellence with customer experiences is by providing customers with an ‘inside-out’ perspective of service operations. For example, providing visibility into the location of a technician enroute to fix an asset, the ability for self-help knowledgebases, or access to service history all allow for greater transparency into the service process. These measures are necessary to provide customers with a better service and, ultimately, a better overall experience. In fact, 56 percent of customers are demanding improved service and organizations who want to attain Best-in-Class need to provide integrated systems to meet the demands of today’s more demanding customer in a competitive marketplace. Integrated technology solutions also allow organizations to work more efficiently, often requiring a smaller workforce, even amid increased volume, while maintaining or elevating CX. Additionally, proactive and predictive maintenance offers less downtime for customers and is an incredible value-add that Best-in-Class organizations can offer; this is a differentiator in today’s world that can set an organization apart from the pack. When determining how to best serve the customer, service organizations need to prioritize investments in an integrated IT systems infrastructure providing full visibility into customer activity and profiles across the entire enterprise. Top-performing companies are more than twice as likely to support their employees with real-time customer insights. These insights enable employees to better serve savvy consumers and provide transparency into the service process that meets or exceeds today’s increasingly demanding customer expectations. Collecting, analyzing, and acting on “Big Data” is a best practice; the question is whether your organization is levering and sharing this information across the organization to meet Best-in-Class status. On the flip side, if your organization has reached the pinnacle of Best-in-Class service, according to the Jolt Service Excellence Curve, integrated enterprises systems are firmly in place. This level of service translates to more efficient operations, lower costs, and heightened CX needed to succeed in today’s consumer-driven world. Aberdeen Group, CEM Executive’s Agenda 2017: A Data Driven Approach to Delight Customers, February 2017. Aberdeen Group, Service Excellence: The Path To Success In Capital Equipment Manufacturing, February 2017.